Advanced retrievers can look very impressive. Let’s look at the Grade One retrieve. It gives you a starting point, and a standard to aim for after a short period of training. It will not be thrown very far, and he will be able to see it quite clearly. He will not be disqualified if he drops it at your feet. No one will judge you unkindly or expect too much. You will be also able to restrain your dog if you wish, so it does not matter if you haven’t got him quite steady yet. At this stage we are looking for a dog that is enthusiastic about retrieving. [wp_ad_camp_1]He will need to be willing to run out and pick up a dummy. And he will need to return to you with the dummy. A neat delivery is the icing on the cake. But it is not essential. It is all about making a start. Excellence comes later. 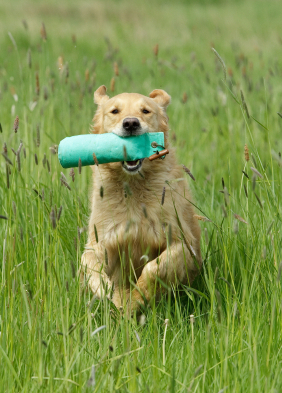 Your dog will need to pick up a canvas dummy in the Grade One Field Test. Many dogs, especially the gundog breeds, and particularly working lines of these breeds have a ‘drive’ or urge to retrieve to some degree. Your job is to find, cherish, and feed this desire, so that it grows and blossoms. The grade one retrieves are both short distance ‘marks’. Although they are very short and simple, it is still worth practicing. Make sure your dog can retrieve at the distance set out for your category of gundog (see below) and that he can do it in different places. Then, when you are ready to take your Grade One field test your dog will gallop out with confidence and style. Don’t forget to book your test as soon as you are ready. It’s a great way to start.